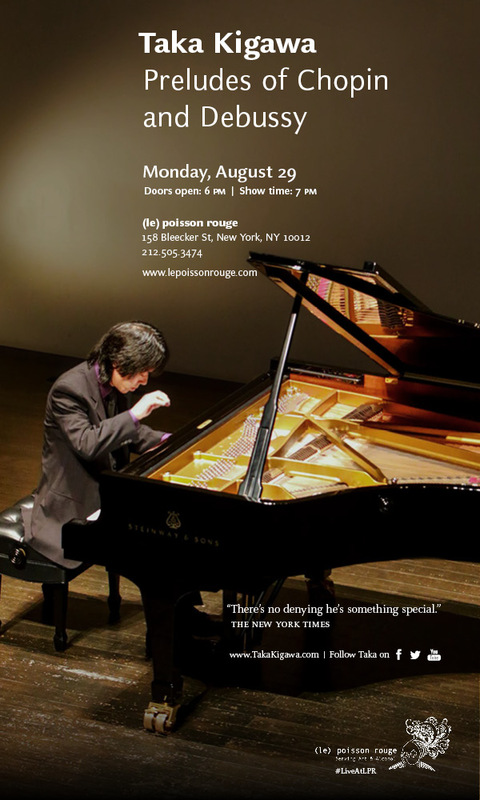 Critically acclaimed concert pianist Taka Kigawa will present a solo recital at (le) Poisson Rouge, performing Frederic Chopin’s 24 Preludes, Op. 28, and Claude Debussy’s Preludes, Books I and II. A native of Nagano, Japan, Kigawa received a Bachelor of Arts from Shinshu University and a Master of Arts from Tokyo Gakugei (Liberal Arts) University, graduating with honors in Piano Performance. He has performed extensively as a recitalist and soloist in New York, with appearances in Weill Recital Hall at Carnegie Hall and Alice Tully Hall; Washington, D.C.; Boston; Cleveland; Paris; Milan; and Barcelona. His New York City recital in 2010 was chosen as one of the best concerts of the year by The New York Times, and his New York City recital in August 2011 was picked as one of the most notable concerts in the 2011-2012 season by Musical America. Kigawa’s solo recitals at (le) Poisson Rouge over the past several years have all been resounding successes, receiving unqualified critical acclaim from both audiences and critics. His August 2012 recital at LPR, in which he performed J.S. Bach’s The Art of Fugue entirely from memory, broke the attendance record in the solo recital genre, a record it holds to this day. Next Next post: Pop-Up Maid Cafe at RESOBOX says, "Welcome Home, Master!"